1983 / Director. Ferninand Fairfax. Nate and Hayes is an Indiana Jones-inspired pirate movie, yet most of the familiar pirate cliches are avoided. Tommy Lee Jones stars as Captain Bully Hayes, a good guy pirate with a moral code. He only kills men who have it coming to them and he never crosses an honest man. 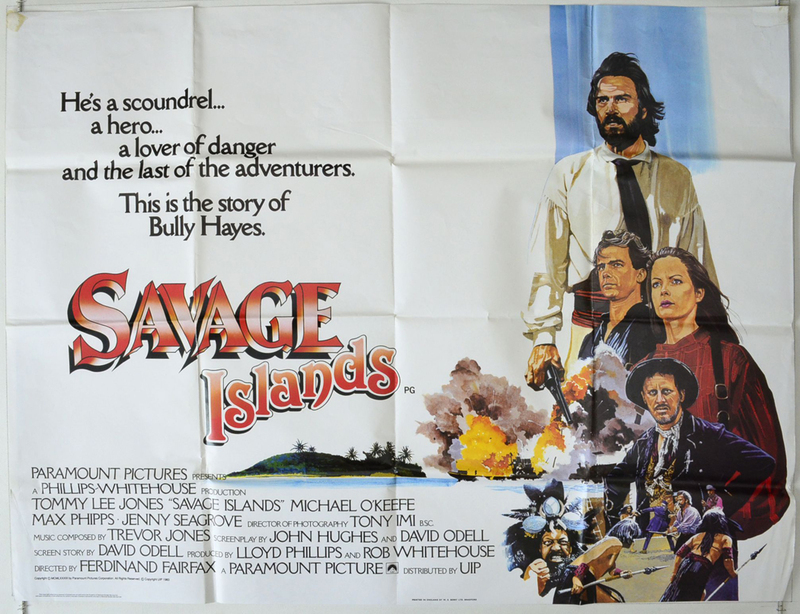 After a routine job of escorting two missionaries to a remote island, he soon discovers that the two have been attacked by the notorious pirate Captain Pease. And so begins a rescue adventure which sees gunfights on the high seas, knife fights in the jungle and an assault on a new type of sea vessel... a German steam warship. As far as pirate movies goes, Nate and Hayes is one of the better ones. It came at a time when the genre was a certain nail in any studio's coffin. The action is wonderful and the use of Fiji and New Zealand locations lends the movie an authentic and exotic aesthetic. Tommy Lee Jones is great and relishes the role. He is supported well by Michael O'Keefe and Max Phipps. Curiously there is an opening action sequence that's almost identical to the famous suspension bridge scene from Temple of Doom. Both films were in production at the same time and this one was released 6 months before Temple... and so who mimicked who is not clear. I dare say Spielberg took some inspiration from this...? Anyhow, the movie stands up to today's standards and it's more violent than the usual family adventure (severed hearts, brutal murders etc). For trivia buffs this was also co-written by John Hughes... what a departure from his usual teen angst comedies. Nate and Hayes wipes the floor with Pirates of the Caribbean. Great fun!